Gender minister Peace Mutuuzo has denied claims that the proposed regulation on artists and music is targeting Bobi Wine, arguing that the regulations are meant to "streamline the industry and protect local artists". The proposed regulation requires artists to register with the Gender Ministry, submit their works for approval and documentation, secure a valid practicing certificate for performance and stay clear of illegal drugs. 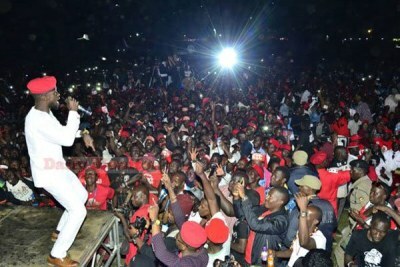 Uganda's musician and lawmaker Bobi Wine on stage at his Kyarenga concert on November 10, 2018 (file photo).